Jones has a very interesting existential idea here, and though he frustratingly doesn’t exploit its every possibility, he does give a great actor an opportunity for a tour-de-force performance. 97 min. Sony Pictures Classics. Director: Duncan Jones. Cast: Sam Rockwell, Benedict Wong, Malcolm Stewart (II), Dominique McElligott, Kevin Spacey. Some movies (who am I kidding? most movies) are best experienced without knowing too much about them beforehand. In our modern multimedia maelstrom, avoiding the previews, press, and “spoilerific” bloggers chatting up a movie is no easy task. Besides, you need to know if it’s worth your twelve bucks. So let’s call this a spoiler-free zone. Now, the tricky bit: why you should see Moon. The short answer is Sam Rockwell, all but the only actor on screen for 97 minutes. Rockwell plays Sam Bell, an astronaut miner near the end of a three-year stint at a corporate moonbase. Except for a robot named Gerty (voiced by Kevin Spacey), Sam is all alone, tasked with mining Earth’s primary energy source, Helium-3. Understandably, Sam is going a bit stir-crazy, a problem that’s exacerbated following an industrial accident. And then things get surreal, with a plot twist that challenges Sam’s sense of reality. That’s mostly what I can say about the plot of this compact outer-space chamber piece without ruining the fun. Amusingly, Gerty displays not emotions but emoticons in a paltry effort to relate to humanity; especially with its single glowing eye and Spacey’s dulcet purr, the Gerty 3000 unavoidably conjures HAL 9000 from 2001: A Space Odyssey. Mostly, the focus remains on blue-collar Sam, who chatters away to his robotic partner, his plants, and himself. He also communicates as best as he can with his wife on Earth, who says he’s changed for the better since he’s been on the moon (not a good sign). Writer-director Duncan Jones (yes, he’s the son of David “Ground Control to Major Tom” Bowie) invokes as his inspirations a bygone, thoughtful science-fiction cinema: Silent Running, Alien, Blade Runner, Outland. Moon’s fiction is indeed predicated on science, including the notion that the next space race may well be dictated by rapacious corporate interests seeking efficient, clean-burning Helium-3. The “what if?” scenarios that follow aren’t quite as convincing, but it’s worth going with them. At its core, Moon is about what it means to face oneself and one’s own mortality--or is that redundant? Jones has a very interesting existential idea here, and though he frustratingly doesn’t exploit its every possibility, he does give a great actor an opportunity for a tour-de-force performance. As his own antagonist, Rockwell gives what’s likely to be one of the best performances of the year, and though I’d be surprised if it’s remembered at Oscar time, it should be. 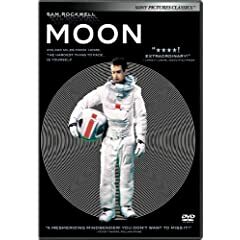 In another fantastic A/V transfer from Sony, Moon looks itself (meaning film-like) and at its very best, with no blemishes or digital artifacts distracting from the presentation. Color and contrast are accurate to the filmmaker's intent, and detail, texture, and black level are all excellent. The lossless DTS-HD Master Audio 5.1 mix is equally fine, with nicely balanced dialogue, music, effects, and ambience; the music and ambience are particularly important for this film, given its significant stretches without dialogue. 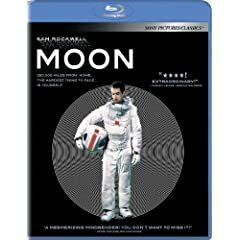 Moon also gets a nicely detailed package of bonus features, kicked off by commentary with writer/director Duncan Jones and producer Stuart Fenegan and commentary with writer/director Duncan Jones, director of photography Gary Shaw, concept designer Gavin Rothery and production designer Tony Noble. The former is a more focused film-school-on-a-disc style track, while the latter is more personable (and chaotic), including anecdotes that give a sense of the DIY production. "'Whistle' A Short Film By Duncan Jones" (28:46, SD) offers the opportunity to see Jones' development as a filmmaker. "The Making of Moon" (16:18, SD) features a wealth of behind-the-scenes footage and enjoyable interviews with Jones, Rockwell, and Fenegan. "Creating the Visual Effects" (11:09, SD) is a reel of effects footage at various stages, with commentary by visual effects supervisor Simon Stanley-Clamp. The "Science Center Q&A with Director Duncan Jones" (20:48, HD) comes from a Space Center Houston special screening. We get Jones' intro and his post-screening Q&A. "Filmmaker's Q&A at the Sundance Film Festival" (11:15, HD) includes the pre-screening intro by Jones and the post-screening Q&A with Jones, Fenegan, producer Trudie Styler, Rockwell, and screenwriter Nathan Parker. Lastly, we get the "Theatrical Trailer" (2:08, HD) and the BD-Live hookup. All site content © 2000-2019 Peter Canavese. Page generated at 04/20/2019 02:48:24PM.